These two teams have met more than 20 times over the past two decades – including once at a Final Four, but Fenerbahce Dogus Istanbul and Baskonia Vitoria Gasteiz will clash in the playoffs for the first time. Let’s look at their shared history, key players and roster makeup. Fenerbahce and Baskonia have met many times over the years in the EuroLeague with their first game back in February 2002 featuring the likes of Luis Scola, Fabricio Oberto and Andres Nocioni for host Tau Ceramica and Zaza Pachulia and Harun Erdenay for visiting Ulker. The most important of their 21 EuroLeague clashes came in the semifinals of the 2016 Turkish Airlines EuroLeague Final Four in Berlin; Fenerbahce edged Laboral Kutxa 88-77 after overtime behind 18 points from Bogdan Bogdanovic, half of which he scored in the extra session. Among other notable games between the teams, Willie Solomon poured in 28 points in the Top 16 finale in 2008 to lead Fenerbahce into the playoffs and Tibor Pleiss and Thomas Heurtel posted double-doubles as Laboral eliminated Fenerbahce from playoff contention in the 2014 Top 16 with a 95-73 rout. This past season Fenerbahce won both regular season meetings between the sides; James Nunnally led six Fenerbahce scorers in double figures with 16 points in a 69-83 road win in Round 10 and Marko Guduric led the way with 18 points in a 79-74 victory in Round 16. That result gave Fenerbahce 8 wins compared to 13 for Baskonia in their head-to-head record. In a league that was dominated by guards this season, the top two big men in the league – at least by the numbers – may be the stars of this series. Baskonia's Toko Shengelia ranks fourth in the league in average performance index rating at 18.7 per game and Fenerbahce's Jan Vesely is seventh at 16.5. The players above them are all guards. The two are also the best scoring big men – Shengelia is ninth at 13.9 points per game and Vesely 14th at 12.9. They have each made 137 two-point shots, which is tied for the most in the league. And if there was a way to measure the impact of their fierce rim-rocking slams, they might well rank as the top two there as well. Shengelia is also third in the league in rebounding (6.2 rpg.) and Vesely is 10th in offensive rebounding (2.2 orpg.). Though there is no guarantee that the two big men will match up head to head all series, you can rest assured that they will challenge each other plenty and each will have a major impact on the outcome. A hot shooting night from downtown can decide a game on any night of the season and if one team gets hot at the right time, it can certainly decide a series. Those statements are amplified when you consider the three-point prowess of the two teams in this series. Fenerbahce is the second-most accurate team from downtown in the EuroLeague this season at 42.4% and Baskonia is fourth (39.9%). Fenerbahce's James Nunnally has made 59.5% of his threes this season, which is the second-most accurate campaign in competition history. Right behind him is Baskonia's Johannes Voigtmann, whose 58.5% three-point shooting this season is the third-best in EuroLeague history. Nunally is one of five Fenerbahce snipers who have made at least two-fifths of their three-point tries. Joining him among his team's elite long-range marksmen are Ali Muhammed (47.5%), Luigi Datome (43.4%), Marko Guduric (41.8%) and Kostas Sloukas (40%). Baskonia has six players shooting at 40% or better from downtown: Voigtmann, Marcelinho Huertas (42.4%), Janis Timma (41.4%), Roddy Beaubois (40.7%), Jayson Granger (40.2%) and Lucas Vildoza (40%). The only thing stopping this series from turning into a total three-point shootout is defense; Fenerbahce held opponents to just 34.9% shooting from downtown and Baskonia's opponents shot just 36.0% from behind the arc. In addition to being the reigning Turkish Airlines EuroLeague champion, Fenerbahce is also making its fourth consecutive playoff appearance. It has won the previous three series in sweeps. Its opponent, Baskonia, will appear in the playoffs for the third consecutive year. Two years ago, it swept Panathinaikos to reach the Final Four, but only one player from the current roster was a part of that; center Ilimane Diop appeared in two of the playoff games. Toko Shengelia also played for Baskonia that season, but was injured before the playoffs. 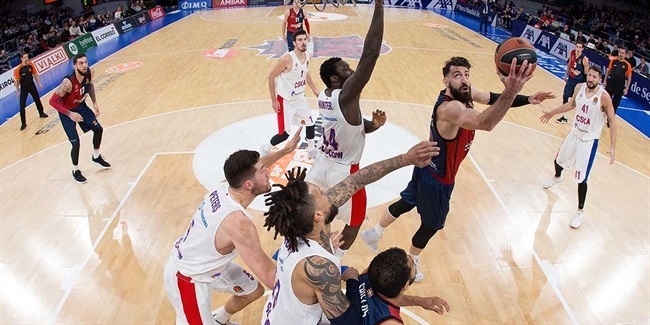 Four Baskonia players are back from last season's playoff squad, which as swept by CSKA Moscow – Diop, Shengelia, Roddy Beaubois and Johannes Voigtmann. In addition, Jayson Granger, Matt Janning and Marcelinho Huertas all bring playoff experience to Baskonia, with the latter two having also reached Final Fours. 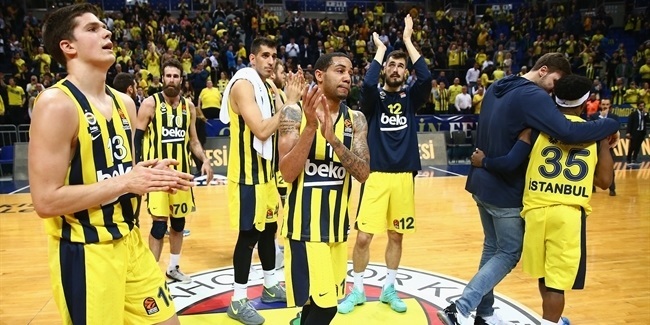 On the other bench, Fenerbahce boasts 10 players back from last season’s championship-squad (Egehan Arna, Luigi Datome, Ahmet Duverioglu, Baris Hersek, Nikola Kalimic, Melih Mahmutoglu, Ali Muhammed, James Nunnally, Kostas Sloukas and Jan Vesely), while the newcomers bring extensive experience. All-EuroLeague guard Brad Wanamaker reached the playoffs with Darussafaka Istanbul last season, Marko Guduric got to the playoffs two seasons ago with Crvena Zvezda mts Belgrade, All-EuroLeague forward Nicolo Melli has been to the playoffs with Olimpia Milan and Sinan Guler has been to the playoffs with two different teams (Anadolu Efes Istanbul and Galatasaray Istanbul). The only player on the Fenerbahce roster who has never before tasted the EuroLeague playoffs is Jason Thompson, who did play in the playoffs in the NBA. When it comes to experience, Fenerbahce holds the advantage. This series features players hailing from a whopping 16 different nations. Fenerbahce’s roster is made up of players born in six different countries and Baskonia players call 11 different lands home. The only country that the two teams have in common is the United States, with four Fenerbahce and one Baskonia player. 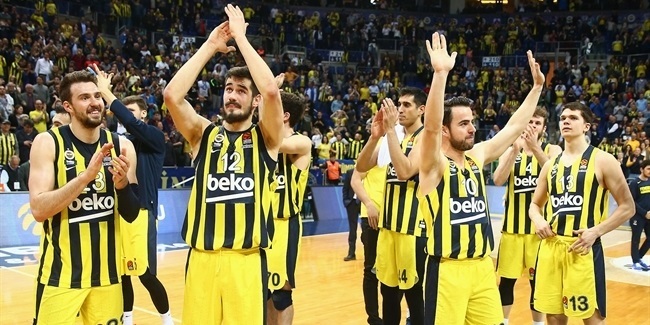 The complete list is as follows for Fenerbahce: the Czech Republic (Jan Vesely), Greece (Kostas Sloukas), Italy (Luigi Datome and Nicolo Melli), Serbia (Marko Guduric), Turkey (Egehan Arna, Ahmet Duverioglu, Sinan Guler, Baris Hersek and Melih Mahmutoglu) and USA (Ali Muhammed, James Nunnally, Jason Thompson and Brad Wanamaker). Baskonia has players from Argentina (Patricio Garino and Luca Vildoza), Brazil (Daniel Bordignon and Marcelinho Huertas), France (Vincent Poirier), Georgia (Toko Shengelia), Germany (Johannes Voigtmann), Guadeloupe (Roddy Beaubois), Latvia (Rinalds Malmanis and Janis Timma), Spain (Miguel Gonzales and Ivan Martinez), Senegal (Ilimane Diop), USA (Matt Janning) and Uruguay (Jayson Granger).